If you are looking for a scale that offers precision weighing, selecting a digital weight indicator that comes with a USB port may be the solution for you. Traditional scales work with a pin spinning to a particular number that can often point between two numbers—forcing you to choose whether your package weighs 10 lbs. or 11 lbs. when the package in question actually weighs somewhere in between. When using a digital weight indicator, you are able to weigh units in measurement of .1 lbs., receiving an accurate measurement instead of just guessing. Another huge feature that a business might want to consider when shopping for a good scale is having a digital weight indicator with a USB port. With a USB port, users have the ability to upload whatever they weigh into their computer. This is a great way for businesses to report their data on a continual basis as their scale can now be connected to their computer and printer, offering them a better way to track their internal processes. Ethernet Connection – This option is a feature designed to be plugged into your network to remotely communicate from one device to another. Users would also be able to access the scale from any computer. There is also a wireless Ethernet option that users can choose. RS-232 – Considered to be the most standard type of communication for digital scales, the RS-232 is designed to communicate with computers alike as well as receiving commands, allowing full remote capability. USB (Universal Serial Bus) – This device is the most favored as it is the least expensive option. It’s compatibility offers simple installation with plug and play ease. Unlike the RS-232, the USB device allows multiple scales to be connected to one computer. 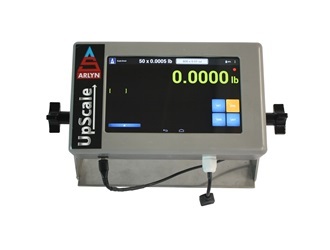 The biggest feature offered to buyers when they purchase an Arlyn Scales Digital Weight Indicator with a USB port, is that they will receive free downloadable software. By simply inserting the scale’s USB into your computer, it will automatically detect the external device and be ready to operate. Users will be able to import their data into any database that is compatible with Microsoft Access. Having the ability to extract data from a scale gives businesses the advantage of monitoring every single item that is weighed. Although DataCol is a simple table application, the data collected can be implemented into other spreadsheets that can calculate a daily, weekly, monthly, or annual total in addition to other reports. For companies that mail out goods frequently, this feature would help keep track of their shipments. For large manufacturers and suppliers, this device might work as a quality control feature ensuring that each container weighs the same. The options for this feature are endless! With the help of the USB’s software, the digital weight indicator offers users an option of how they would like their data received. For instance, you can decide whether you want the item weighed recorded into the software automatically or manually. For manual input, the user simply presses the ‘Enter Weight’ button and the amount of that particular item weighed will appear on the screen within the software application. If it is easier to get a reading just as the item is placed on the scale, then you can adjust your settings by selecting the ‘Auto Entry Mode’ checkbox. This feature automatically empowers the ‘Enabling Polling’ feature that automatically records the data into DataCol as each item is weighed. Data being automatically uploaded into your computer is a fantastic feature that is referred to as Automatic Polling. Taking it a step further, the collection of data can be printed from your computer on a timed basis. If it is preferred to save paper and print the reports as needed, users will be able to adjust the settings so that the software will only print on demand. To prevent the automatic input of fluctuating weights, a Print-at-Stability function has been installed. With this feature, the software will take in readings from the scale only when the item weighed reaches a stable weight—something that can be done with a digital weight indicator ensuring the most accurate weight recordings! Arlyn Scales is located in Long Island, NY and has been assembling scale designs for over 30 years. We even help our customers save money by eliminating dealer mark-ups, shipping directly from our factory!